Your Trading Edge (YTE) magazine is Australia’s leading trading and investing publication covering all aspects of CFDs, stocks, futures, forex and commodities. One of the team at YTE completed a review of CFDs Made Simple in the May/June publication which is available for viewing by left clicking on the magazine image below. It will then open as part of the website. TraderPlus also ran a review of the CFDs Made Simple book along with a couple of other useful trading books that were released in 2011. In addition to the review on CFDs Made Simple, they also reviewed The Wiley Trading Guide Volume 2, in which both Jeff and Ashley were featured with a chapter on position sizing strategies. Find out more about the articles provided on TraderPlus by going to their website. Click Here to visit their site. 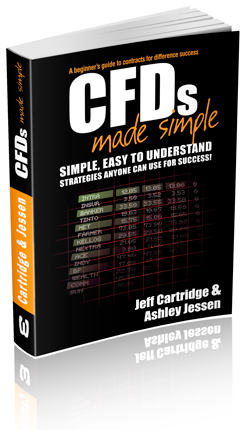 CFDs Made Simple is the essential guide for anyone who wants to make money trading CFDs. Contracts for difference (CFDs) offer an opportunity to make your money work hard for you with the potential for large returns on little outlay. This book includes the information you need to know to get started trading CFDs, and it provides tried-and-true strategies anyone can use. If you’re ready to make the move from trading shares to trading CFDs and maximise your success without all the stress, this is the book for you. If you’d like to reference CFDs Made Simple on your website then please use the images below and be sure to share your link or reference with us via our Contact Us page. If you need a different size image to what we have below then get in touch and our graphics team will create something for you. To access the image in a range of different sizes simply right click on the size you’d like below and save to your computer.